About the author: Lawrence Hislop is the Executive Director of the global Climate and Cryosphere project (CliC) of the WMO World Climate Research Programme. He has fifteen years of international experience leading research and policy development on polar and high mountain environmental issues. 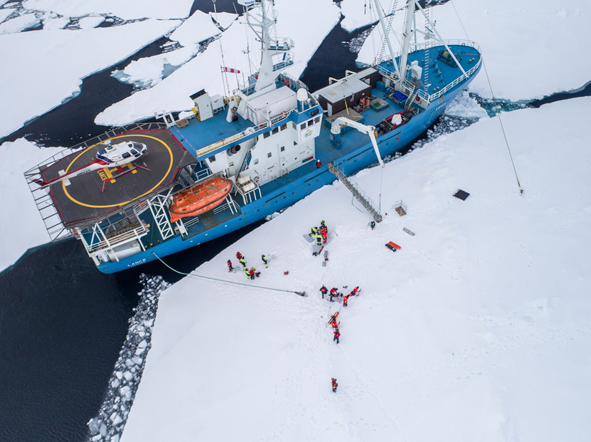 In his contribution to Polar Prediction Matters he outlines the format, implementation and key outcomes of a recent workshop aimed at exploring the needs of sea ice forecast users. Increasing uncertainty about future sea ice conditions presents a distinct challenge to industry, policymakers, and planners responsible for economic, safety, and risk mitigation decisions. 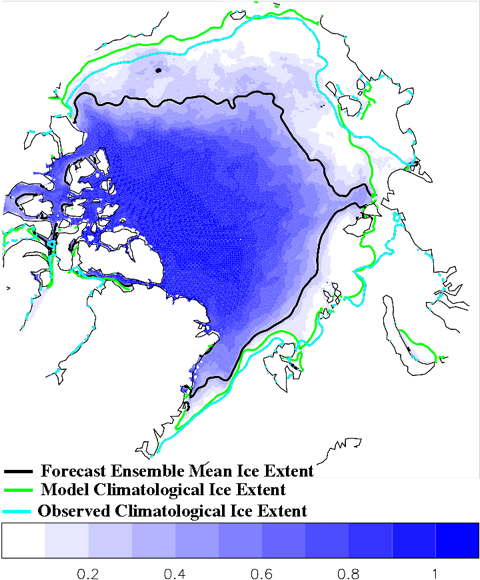 The ability to accurately forecast the extent and duration of Arctic sea ice on different timescales provides significant implications for the operation of wide-ranging Arctic maritime activities. In the last decade, the complexity of methods used to make sea ice predictions has increased considerably, with many new contributions from the modelling community. But are these developments finding their way into better forecast products that meet the specific needs of the individual stakeholders composing the forecast user community? What is actually needed to ensure the safety of the crew and ships operating in ice-covered waters, to comply with international standards and regulations, and to enable sustainable economic development? To explore ways to improve the utility of sea ice forecasts, a small group of partners (listed below) in sea ice research and forecasting organised a workshop during the Arctic Frontiers conference in Tromso, Norway in January 2018. The main goal was to bring together sea ice forecasters and stakeholders, to have an open discussion on what is possible to achieve with current forecasting systems and how to better meet stakeholders’ needs. Many other complementary projects are also focussing on this topic, and the hope is to link communities, share workshop results, and follow up with more dialogue. 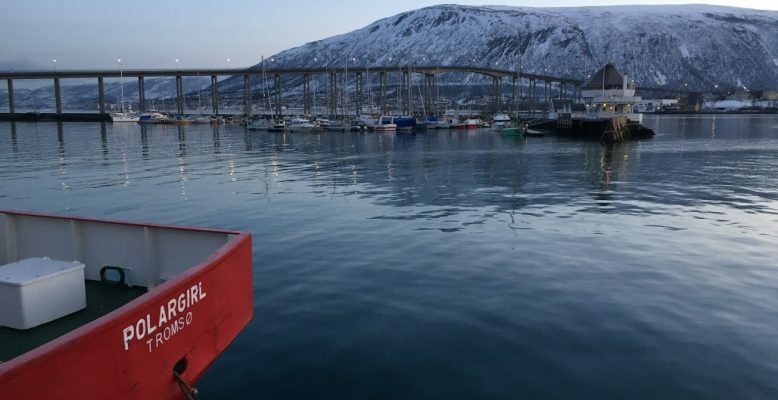 The organising committee for the Arctic Frontiers workshop assembled a cross-section of forecasters from Europe and North America along with key representatives from the private sector to discuss emerging issues and highlight opportunities. The workshop focused on creating an engaging dialogue and gathering feedback from all participants in order to get a better understanding of current and future user needs. What is the economic value of current forecasting systems? How are forecasts used in decision making, and if not, then why? What are the limits and opportunities associated with current forecasting systems? The half-day workshop was organised around individual presentations in the first section, to help set the stage and introduce some key discussion items. This part focussed on the capabilities of sea-ice forecasting products and was followed by presentations on user and stakeholder needs from an operations and management perspective. The second section was structured around small breakout groups that discussed the overarching and more specific pre-selected questions (Figure 1). The last part of the workshop was a series of plenary presentations summing up the discussions and conclusions. Ingrid H. Onarheim (U Bergen/Bjerknes Centre, Norway): Seasonal to decadal forecasts. These presentations set the stage for understanding current capabilities, techniques and products available for planning and real-time access. Morten Mejlænder-Larsen (Arctic Operation, DNV GL, Norway): Logistics and long-term planning in the Arctic. 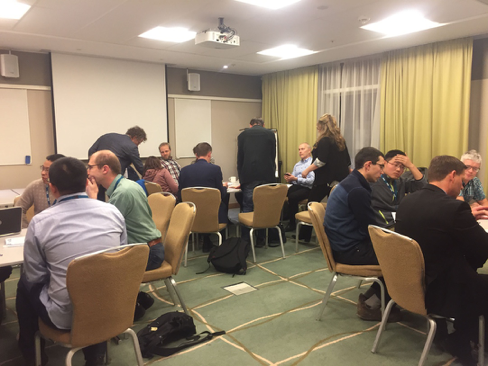 The participants then divided into six predefined breakout groups (7-9 participants each) composed of “operators” and “managers”. The discussions were moderated by selected participants from the science community. During 45 minutes, discussions evolved around the overarching questions as well as some specific questions the organisers prepared in advance. The groups formulated concerns and proposed recommendations going forward. The presentation of key outcomes in the subsequent plenary session revealed overarching needs of the user community that repeated throughout the presentations, as well as some sector-specific issues and requirements. Paramount for all industries was ensuring the safety of the crew and ships operating in ice-covered waters (Figure 2), complying with the Polar Code, and following related international standards and regulations. The benefits of accurate sea ice forecasts were therefore highly valued for safeguarding the passage of vessels, improved logistics planning and overall efficiency. Participants noted the importance of forecasts and the help they can provide in saving fuel and time as well as in reducing costs of maintenance and insurance. 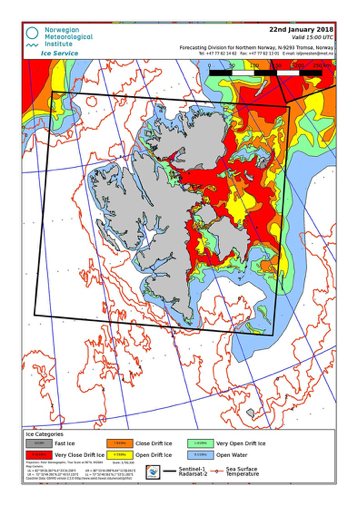 Moreover, the need for real-time information on the current sea ice state (Figure 3) and for small-scale and high-resolution products was highlighted. Companies ultimately need to know if they can get through a very specific area, e.g. straits, bottlenecks and essential gateways. Therefore, the ice thickness and strength in real time at a specific location and knowing where the marginal ice zone transitions into pack ice is critical to moving ships safely and efficiently. Figure 3: Sea ice chart of Svalbard for January 22, 2018. Norwegian Meteorological Institute – MET Norway Norwegian Ice Service. In contrast to forecasts, typical ice charts such as this one are derived from near-real-time satellite observations and thus depict the current situation. An overarching need identified by many of the participants centred around improved communications, both on the technical side and regarding human capacity/ability. North of 79 degrees the main form of telecommunications is with Iridium technology and the data transfer is only 30kb/s – which can be very limiting (especially for high-resolution and real-time information). Any new forecast products or services will need to consider these limitations. Companies would also like more standards and agreement among forecasters for defining important information such as the ice edge (Figure 4), first-year vs multi-year ice and overall quality of ice. There was consensus among the participants that the human aspect of interpreting and conveying information in the right ways could dramatically improve these issues going forward. Increased dialogue between forecasters and the user community is essential for developing new products and services that can help with short- and long-term planning. Figure 4: The large-scale seasonal forecast from June for September 2017 sea ice probability (the probability to encounter sea ice with concentration higher than 15%) as provided by the Met Office UK. The black line is the ice edge (15% concentration contour) of the September ensemble mean sea ice concentration. The coloured lines depict the climatological ice edge for the period 1993-2015 from the model (green) and from observations (cyan). Going forward the event organisers are looking to establish cooperation opportunities with the participants and to develop a longer-term strategy for continued engagement between these communities. There are many opportunities for improvements in the reliability of sea ice forecasts and an eagerness amongst users to help tailor products that suit their needs. Such dialogue and enhancements should lead to better informed stakeholder decision making, safer passage of vessels and sustainable economic development. The following workshop sponsors are acknowledged: The University College London (UCL), the Arctic Research Consortium of the U.S. (ARCUS), the Norwegian Ice Service – MET Norway, the Bjerknes Centre for Climate Research, The Climate and Cryosphere (CliC) project of the World Climate Research Programme (WCRP), EU-PolarNet and the Research Council of Norway.